It was my birthday weekend and just by chance Eric Kunze was performing with the New York Pops at the same time. I hadn't been to the city since 2004 with my niece Jessica and this was the perfect opportunity to return. I had traveled alone before but always had Georg at home in case I needed him. Surprisingly I was less uncomfortable than I thought I would be, eating at restaurants by myself and finding my way around. My hotel, the Park Central lived up to its name - right across the street from Carnegie Hall, next to the restaurant I was meeting at with my friends and three blocks from Central Park. I signed up for Lyft, an alternative to Uber and received five free $10 rides, so I could move about easily. My friend Mary was meeting me on Sunday, so in the meantime I was able to explore the city, going to Central Park where spring blossoms were in bloom and seeing the musical, Tuck Everlasting. In the cast were Terrance Mann and Kathy Voytko, both of whom I had met and spent time with through Eric. New York is a foodies mecca and I enjoyed eating nearby at Petrossian and Cognac, both French food restaurants, and Red Eye Grill. Sunday was rainy and I took Lyft to Times Square Church, originally founded by David Wilkerson, author of "The Cross and the Switchblade", friend and coworker in the faith of our Pastor Alex Silva. David is deceased now, but the church has continued to be wildly successful with attendance on a Sunday at various services numbering 6000 to 7000 people. The church purchased the former Mark Hellinger Theatre, built in 1930 and has kept it in original condition. Mary met me on Sunday and we had dinner with Eric and his friends who were in town from California to attend the performance. Dinner was at Carmine's, a favorite of Eric's when he lived in New York during his Broadway performance period in the 90's. We were joined by his friends Gina, Danny, Anthony and Allison and Broadway pals Norm Lewis (the first black Phantom) and Keith Bearden, currently in Wicked. Eric was busy Monday with rehearsals, so Mary and I took Lyft downtown to the World Trade Center site. We were immediately moved as we stepped onto the monument grounds. The sense of grief and tragedy was palpable and the mood was quiet and somber as people stood respectfully at the waterfall pool with the names of the lost engraved in granite all around the pool. We would have liked to go into the museum but there was a very long line and we decided to save it for another trip. Our next stop was lunch at ABC Kitchen at the ABC Carpet and Home store. We swooned over the fresh menu and afterward at the fantastic home decor items on six floors of the largest carpet and home store in the world, dubbed "Disneyland for rich adults". After freshening up at the hotel we met my oldest friend Ingrid (her parents and mine brought us over on the boat together from Germany in the 50's so they could work in the US) . Ingrid and her daughter and daughter-in-law were attending the concert with us. We had a wonderful meal at Red Eye Grill, right across the street from Carnegie Hall. After dinner we proceded to the concert hall. It was my first visit to Carnegie, which presented its first performance in 1891 and I was starstruck. So many of the greats have appeared on that stage including George Gershwin, Benny Goodman, Maria Callas and the Beatles. 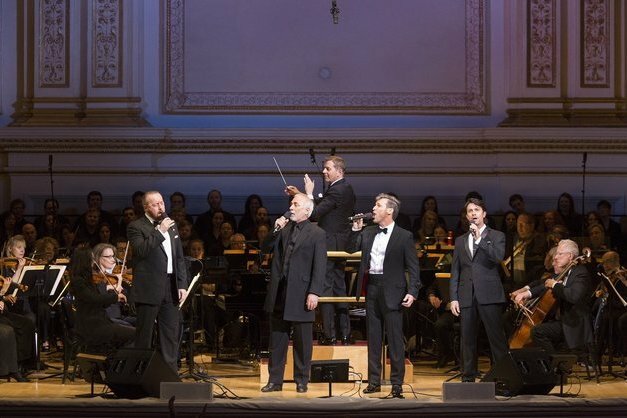 The New York Pops, led by conductor Steven Reineke, was celebrating it's 33rd anniversary and chose that occasion to honor Alain Boublil and Claude-Michel Schonberg, composers of many musicals including Les Miserables, Miss Saigon, the Pirate Queen, Martin Guerre and others. Eric was among other great performers who joined the Pops in singing selections from these musicals. It was a great honor and a thrill to be there to witness it. After the concert I was able to go backstage to congratulate Eric and the cast, including Lea Salonga, who was Eric's co-star in Les Miserables in 1993. Also present were Alain Boublil and his wife and co-performer Marie Zamora, as well as the dinner friends from the night before. I topped off the evening with a nice long visit at my hotel with Anita Riggio and her husband Roland. Anita has written a groundbreaking new musical called "Brindlebeast" which is to star Eric someday. She has been working very hard to get it up and running. I headed home the next day, but not before making plans to return soon. On the agenda for next time is walking the Brooklyn Bridge, seeing the Tonight Show with Jimmy Fallon and visiting the 911 Museum. To see a slide show of the full album click.here.